The Network Addon Mod (NAM) is a mod improving and expanding upon the functionality of the game's transit networks, produced by the NAM team. The most recent stable version, Version 35, was released on November 5, 2016. For information on the current release of the NAM and where to download go to NAM Plugin. The NAM project was founded by redlotus, the7trumpets and Tropod, part of Modd Squad Transport (now the NAM Team) in 2004, with Version 1 being released on April 24, 2004. Tropod headed up most of the early development on the project, earning him the moniker "Mr. NAM", up until the Version 19 release in October 2005. In its initial form, it largely consisted of a series of bugfixes and a variety of Traffic Simulator plugin options to improve pathfinding, as well as a few new transit items. As the mod progressed, the focus shifted toward the creation of new transit items, beginning with the viaduct overpass puzzle pieces and new interchanges for Maxis Highways. Going into 2005, the Ground Light Rail (GLR) system was added, as well as several new draggable items, including Diagonal Streets, the Road, One-Way Road and Street Roundabout Plugins, and the Road and Avenue Turning Lane Plugins, as well as the Elevated Rail-above-Road dual-network puzzle pieces. Between October 2005 and the end of 2006, the project went into a hiatus from public activity, but was revived by several SFBT members, including memo, Andreas, GoaSkin, and ArkenbergeJoe, along with a few other prior team members, resulting in the release of Version 20 in December 2006, which introduced the Diagonal Street Helper Pieces (the first instance of a WAVERide setup), and the URail system. With Version 21, the June 2007 release, the NAM was "modularized", separating the main RUL Files that made the mod function out into a separate NAM Controller file. This was done in order to prevent various conflicts that had occurred, such as the NAM Version 20/RHW Version 1.2 conflict in early 2007, and to allow for easier updating of NAM Plugins. This also marked the start of the NAM Optional Plugins program, beginning with Version 1.3b of the then-Rural Highway Mod being released concurrently with the June 2007 NAM, and the first release of the Street Addon Mod in September 2007. Version 21 also marked the introduction of Draggable GLR, the first Override Network, as well as the Avenue Roundabouts, Tram-in-Avenue, and Road Wide-Radius Curve puzzle pieces. After Version 21, the team's personnel ranks expanded considerably. The next release, Version 22, released January 1, 2008, was not released as a full NAM version, but rather, used an "update" package, through which the user could simply update their Version 21 files. The subsequent Version 23 release returned to the full package paradigm, and brought several new traffic simulator options developed by jplumbley and mott to the NAM, reflecting the latest research. 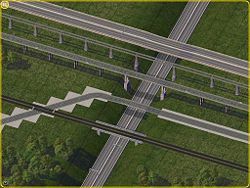 Beginning with Version 24 in January 2009, much of the new content being added to the NAM itself was by the very productive SFBT unit led by Chrisim, producing the Tram-Road Addon Mod, Flexible Underpasses, and URail content. Fractional Angle Roads and Railroads, a project of dedgren and Tarkus also debuted here. 2009 would see 3 more NAM releases, in March (Version 25, concurrent with the initial Rail Addon Mod (RAM) release), June (Version 26, the first release of the Canal Addon Mod), and a small update in July (Version 27). 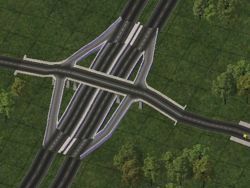 2009 also saw the inclusion of the first new Maxis Highway interchanges since 2005, courtesy of andreharv. There were two releases in 2010, including Version 28 in May, which marked the introduction of the NAM Unified Traffic Simulator and related Traffic Simulator Configuration Tool (TSCT), the Turn Lane Extension Pieces (TuLEPS) and the initial offering of the long-awaited Network Widening Mod (NWM), followed by Version 29 in August. In September 2011, Version 30 was released, concurrent with RealHighway Version 5.0 and Network Widening Mod Version 2.0. The NAM Team decided earlier in 2011 to move away from the existing "Modular NAM" concept and toward adopting a "Monolithic NAM" paradigm for NAM Version 31. After the "Monolithic NAM" was implemented, all previous major "external" NAM plugins, such as the RealHighway, Network Widening Mod, Rail Addon Mod, High Speed Rail Project, Street Addon Mod and Rural Roads Plugin, were merged into the NAM Core itself, simplifying the package considerably. For the first and only time, the NAM Team announced a release date for NAM 31, of March 1st, 2013. The release actually reached the LEX and STEX on March 2nd. Due to the radical changes of NAM 31, the NAM Team released a "NAM 31.1" and "NAM 31.2" to fix up the problems found in the initial release. For the NAM 32 cycle, the team decided to implement a public pre-release system, in order to subject the mod to a broader series of tests. The first pre-release build of NAM 32, Pre-Release 1 (PR1) was made available on December 19th, 2013. The pre-release process helped the team polish the resultant full release, which came out less than a month later, on January 14th, 2014. A Mac-only NAM 32.1 release was issued on July 28, 2014, designed to address the crash-to-desktop issues that affected some critical NAM components on the Aspyr port of SC4, which had previously led the NAM Team to drop Mac support after NAM 29. No other features were added or updated as part of that release. After a lengthy development cycle of more than 18 months, NAM 33 finally emerged as a pre-release build on July 29th, 2015. The official release of NAM 33 went live on November 26, 2015, in time for Thanksgiving in the United States. In sharp contrast, and following with the team's renewed commitment to smaller, more rapidfire releases, NAM 34 was released on Christmas Day 2015. A avenue/road interchange, released as part of a pre-NAM transit mod. On-slope and double-height network puzzle pieces are some highly-anticipated components included in the past few NAM versions. The NAM is a RUL-bound Plugin, in that it contains modified versions of the game's RUL Files, which control the placement and layout of transit items in-game. These RUL modifications are what allow for the numerous puzzle pieces, draggable additions and bridges that are possible with the NAM. The NAM Team serves as a community steward for the RUL files, ensuring that all RUL-bound transit content is compatible and interoperable. One of the other oft-mentioned features of the mod are the modifications to the Traffic Simulator. The current offering as of NAM Version 29 is the NAM Unified Traffic Simulator, developed by z over several years. This simulator plugin comes in several different capacity flavors (Classic, Low, Medium, High and Ultra) and can be further customized with the Traffic Simulator Configuration Tool. It is specifically optimized for use with several NAM periphery plugins such as RealHighways and the Network Widening Mod, which require specific settings in order to function properly. The Certified Team & Project that this article is about can be found here on SC4D. This page was last modified on 5 November 2016, at 21:00. This page has been accessed 280,778 times.